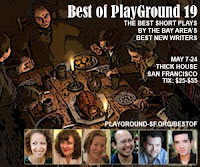 Best of PlayGround 19 is happening right now at The Thick House in San Francisco until June 14, 2015 and the evening is full of inventive storytelling, excellent acting and original writing. Six plays run the gamut from introspective to bawdy. ‘Reading Babar’ in 2070 by Rachel Bublitz, directed by Rebecca Ennals tells the story of a future facing extinction, while ‘Preapocalyptica’ by Erin Marie Panttaja, directed by Katja Rivera is a glimpse to our very real danger of drought. ‘Frankenstein's Grandmother’ by Steven Westdahl, directed by Tracy Ward envisions the 'bet' that caused the creation of a monster, while ‘Art and Tech’ by Kirk Shimano, directed by Jon Tracy sees the creation and collapse of a relationship. is a powerful meditation on a found and lost childhood. 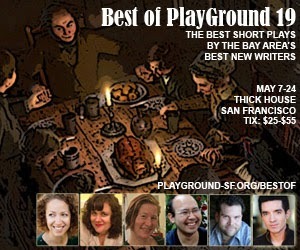 Finally, ‘Cratchit’ by Davern Wright, directed by Jim Kleinmann is a wildly funny take on the tired Chistmas Carol story. All in all, the evenings offering's are entertaining and impactful. Well worth the trip to see original, thought-provoking and clever theater.